I love turntables, I think they are an excellent way to display a model. 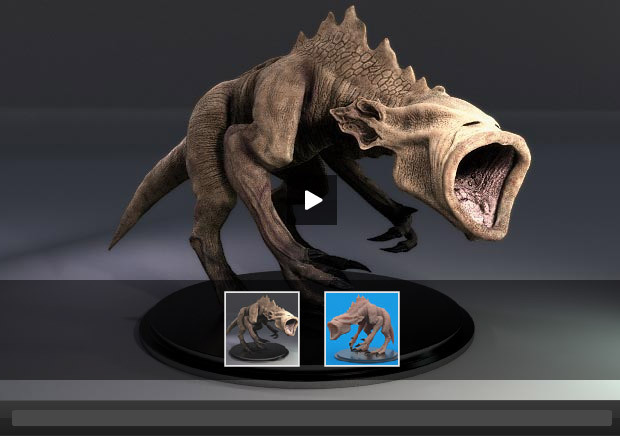 I got inspired of what Pixologic did with their ZBrush turntable gallery, so I dusted of my old flash knowledge and implemented a turntable function, as I was anyway doing some fine tuning to the site design. Now when my portfolio update finally is around the corner, I wanted to have something like this to accompany the content I’ll put there. And it will also come in handy for my ZBrush sketches and doodles here in the journal. So expect to see lot’s of more turntables to spin around in here. I’ve been toying with the idea if I should add a play button to loop the spin around, which could look nice, but came to the conclusion that it defeats the purpose of studying the model. Annoys the crap out of me though that the actionscript editor as well as the as3 class editor in Flash CS 4 is the most sluggish piece of software I’ve ever used. I did seriously consider reverting back to CS 3 just because it took forever to work with the code. I too have some models that I would like to use in a turntable application like yours. Can you share some insight as to how you did it? I like the model on the blue background better than than the 1st. Pehaps you could combine the sss on the first as well. I’ll see if I have some spare time coming up, and I can put it online with a pretty turn around clip compiler. Otherwise if you have some flash knowledge you can get it “as is” in it’s current state from me if you contact me. It is kind of you to share the application and yes I would like to see if I can get it working for my use. I will post you back a link if I can do anything with it. hi if possible can you post the indo on making the flash based turntable? is there any chance that you could send me the flash file too? I’ll just clean up a few things to make it user friendly, I hope to be able to have it up tonight, I’ll post it in my Journal then, so just check back here in a day or so and It’ll probably be available for download.